We are an evangelical, charismatic Anglican church located in the mid northern beachside suburb of Karrinyup, Perth, Western Australia. We maintain a strong link with our rich liturgical heritage. We have foundations in the historical Anglican church which recognises the authority of God's Word (The Bible) as final, the wisdom of the ancient creeds as inspired, and the revelation of God as Father, Son and Holy Spirit as central to our belief. We are committed to the truth of the Bible, the Word of God. A Christ-centred church that is prayerful and empowered by the Holy Spirit to connect with the community it serves, both locally and afar. We have a mission to make the love and power of the living Jesus Christ known in Karrinyup and beyond. Torrentially heavy rains in early 2017 brought out “stigmata” on the brickwork, revealing the original name of Karrinyup Anglican Church - St. Francis of Assisi, a name still fondly remembered by many church members. June 2018 marked the 30th anniversary of the consecration of the KAC building. 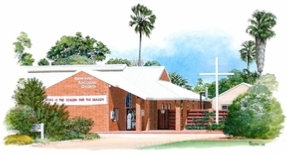 The real church at KAC began back in the early 1970s when the dioceses built the rectory on the plot of land next to the land that had been purchased for the church. A Sunday service was held each week in what is now the rector’s office (originally designed as a carport). A large turnout meant that the sliding doors into the rectory’s lounge room were opened to allow for expansion. Eventually the congregation moved to worship at the Stirling Players theatre in Morris Place and later the move was made to the Community Centre adjoining the Karrinyup Library. It was a gift of $50,000 from St. Columba’s Church in Scarborough that finally got the ball rolling on the building of KAC.